Listen to a podcast from glasshalffull.online about providing yoga for people with disabilities with our very own teacher JoAnn Lyons. 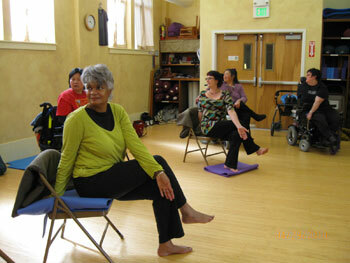 This is an excerpt from an article from Do You Yoga about Accessible Yoga. PYC was the #2 organization mentioned in the article. 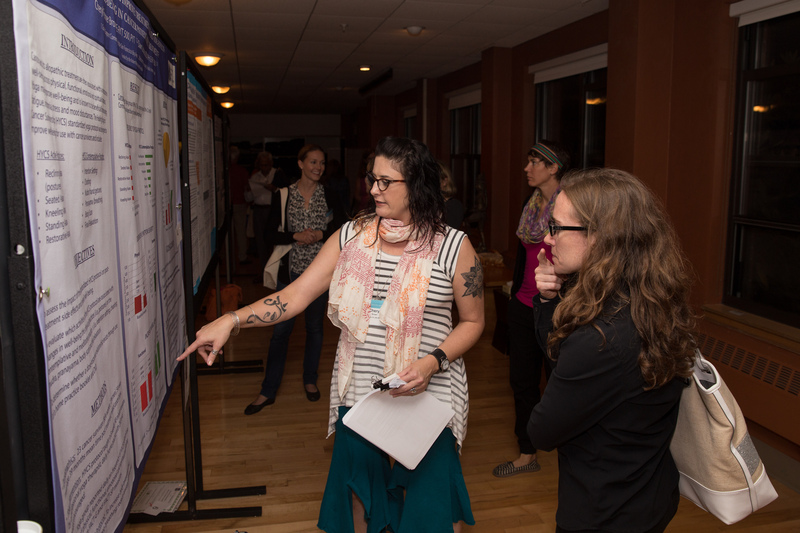 Cheryl Fenner Brown is seen here as a presenter at Kripalu's Symposium on Yoga Research. Cheryl's research project was an 8-week community-based study including 23 cancer patients (86% women, 13% men, mean age=54 years, mean time post-treatment=39 months). The Healing Yoga for Cancer Survivorship (HYCS) intervention included intention setting, chanting, mudra, reclining, seated, kneeling, standing and restorative yoga, pranayama, body scan, and relaxation in a once weekly 90-minute session over 8 consecutive weeks taught by a Professional Yoga Therapist. The intended benefit of HYCS protocols was to increase body awareness and lymphatic drainage; facilitate deep breathing; reduce anxiety, edema and muscle tension; and induce relaxation. A DVD and booklet of the protocol was provided for voluntary home use. Yoga participants were asked to report daily on which HYCS protocols were practiced, medication changes, and well-being factors (physical, functional, emotional, spiritual) using an onlineassessment form based on validated FACT-G and FACT-Sp questionnaires. The primary outcome was to correlate change in well-being factors based on which HYCS protocols used as measured by the questionnaires. Control group reported weekly on medication changes and well-being factors. To see the banner showing the results click here. [The classes] help me learn more about my body, they way I move it, the way I hold it, the way I should shift it to have a better alignment to be safer, healthier and stronger. I am more aware of my body, what works for me and how to use props to get myself into postures I never thought I could. I also like learning how to engage the specific muscles and organs." "The explanation of what we were going to do before doing it, as well as the demonstration followed by the instruction given. The repetition of the different position helped to reinforce the positions so that I was able to practice at home."